I first had Bard’s several years ago. At that time it was one on the few gluten free beer’s available, and I was happy to have it. In the past few years Bard’s hasn’t been as readily available in my local stores in North Carolina. I found this bottle, the first I’ve had in 5 years, in a specialty beer and wine store. 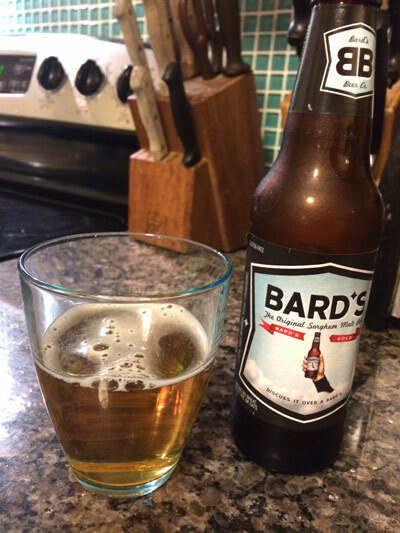 Crisp and drinkable, without a noticeable sorghum taste makes Bard’s a good solid gluten free beer. As the beer warms up that unpleasant sorghum taste starts to creep in, so I suggest you keep this one cold. Overall this beer is well-balanced, and drinkable. Taste – crisp front taste with distinct apple and caramel notes, a thin middle and a finish that tail off with a slight sweet aftertaste. One of the more drinkable American style sorghum beers.